Bristol's Finest in Miami this Thursday! That was Joker playing for thousands of people at the legendary Sonar Festival in Barcelona, Spain. This Thursday he comes to Miami for the first time to play our monthly Get Low bash at The Vagabond's (((SHAKE))) He's bringing Rinse FM's MC Nomad with him so it's sure to be huge. 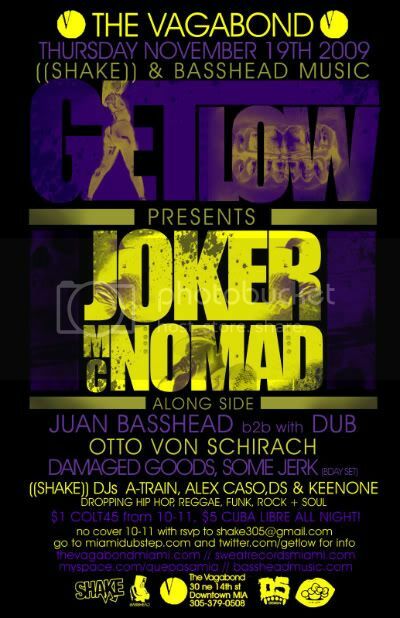 Juan Basshead, Otto von Schirach, Somejerk, Damaged Goods, Dub + MCs Jumanji + The Nome representing for the hometeam. Attention all bassheads: The future is now. Aged just 20, Joker is an immensely precocious talent, he burst onto the Dubstep and Grime scenes in 2008 with the vibrant ‘Grimey Princess’ and ‘Gully Brook Lane’ which were released on Earwax and Plastician’s Terrorhythm imprint respectively. His productions possess a rare duality of intense and nonchalant energy, the soundtrack to a pimp on an interstellar journey. and Lil Boots, his productions are battered by DJs including Skream, Rustie, Harmonic 313 and Plastician. Pitchfork named Joker "2008 Producer Of The Year", a huge accolade for a producer who’s not only just out of his teens but also just out of the starting blocks. Born to Grime and adopted by Dubstep, Joker is reluctant to be classified, but his soul drenched productions have been described as Jehri Curl Boogie and Wiley stuck in an elevator with Cameo. Whatever you call it, as we move through 2009 and beyond, Joker is one of the shining stars that can be seen in the distance and by the time the light of his electric melody’s reaches our eardrums he has already begun the next phase of his journey. some sick flicks of the evening's affair. for the proper Halloween vibes.